"In Spain, Leon is born on Christmas day to a mute servant girl who was raped by a beggar. His mother dies giving birth and he is looked after by Don Alfredo..."
One of the things which I never realised about Hammer until I started blogging was that all they really did was remake the Universal monster movies in colour with better actors and more boobies. Okay, so that's a bit of an over simplification, but Hammer were essentially still quite a low-budget operation who, apart from being extremely lucky with their talent both in front of and behind the camera, tended to stick to more traditional horror characters rather than invent any new icons or more modern storylines. Ultimately, it was their downfall, but in their heyday, everyone apart from the critics loved Hammer. There's just something cosy and familiar about Hammer movies especially if you're British which makes them great for Hallowe'en. There are even some scares along the way if you are willing to suspend your disbelief and focus on the acting rather than the effects. With "The Curse of the Werewolf", you really do have to try to ignore the effects as much as possible because they are more likely to make a modern audience laugh than appreciate the work which went into them at the time. Based on the novel "The Werewolf of Paris" by Guy Endore, the screenplay was actually written by Anthony Hinds who later wrote Tyburn Film's "Legend of the Werewolf" (1975). It's fairly easy to get the two movies confused not only because of the changes to the book's setting but also because Hammer, Amicus and Tyburn productions tended to share the same casts and crews. If you remember that "The Curse of the Werewolf" is set in 16th century Spain and "Legend of the Werewolf" is set in 19th century France, it helps. Lets face it though, if you've seen one werewolf movie, you've seen them all, and the plots are still likely to get jumbled together. I actually prefer "Legend of the Werewolf" to "The Curse of the Werewolf" even though, technically and stylistically, "The Curse of the Werewolf" is the better film. 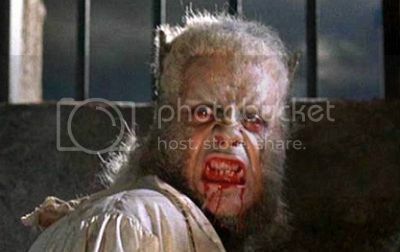 If you are a big Oliver Reed fan (or even if you're not), you'll love that a big chunk of "The Curse of the Werewolf" is comprised of him acting his heart out in period costume and, basically, giving one of the best performances of his entire career. His character goes through every emotion in the book and, while not always all that likeable, he's certainly a lot more convincing than Lon Chaney Jr. in "The Wolfman" (1941). Strangely, "The Curse of the Werewolf" was Hammer's only werewolf film. I'm sure that the difficulties involved in making a werewolf transformation which wouldn't have the cinema audiences rolling in the aisles with laughter was the reason they never made another. The "Hammer House of Horror" TV series did return to the werewolf subgenre for its "Children of the Full Moon" episode, but that wasn't until 1980 and, of course, it was a vastly different story which very wisely saved its werewolf make-up for the very end where it could do the least amount of damage. The small problem I have with "The Curse of the Werewolf" is that it over ambitiously goes through several time periods which aren't equally interesting. The first, featuring Yvonne Romain as a mute servant girl who gets raped by a beggar, is actually the most horrific and exploitative part of the story. Several scenes were deemed either too violent or disgusting and were cut prior to the theatrical release, but they were restored in 1994. One of the previously censored moments is still really quite sickening unless you are one of those freaks who likes to look for similar nastiness on YouTube. I'm not going to spoil it for you by telling you what it is, but you may not want to eat any pork rinds while you watch this film. The later story is kind of uneven, doesn't really fit the setting or have as much atmosphere as Hammer's more German-looking period pieces do, but Oliver Reed's charisma makes up for a lot of the other failings. The attempt at an ill-fated romance has some horribly dated dialogue and doesn't work so well, but when things start getting hairy, "The Curse of the Werewolf" is fantastic. If there was ever a perfectly cast "wild man", it was Olly. The werewolf action is quite sparse, pretty obvious and predictable, but that's exactly what it's supposed to be. It's nice to get a horror movie which delivers few surprises when you are in the mood for a certain subgenre. The seriousness of the acting and the cinematography lifts everything up several notches, but nobody watches a movie called "The Curse of the Werewolf" if they are expecting highbrow entertainment. I could have recommended a couple of other equally famous werewolf movies instead of "The Curse of the Werewolf", but they would only be further clones of the same subject matter. "The Curse of the Werewolf" has several very original changes to the established mythology and all the tragedy which goes with them.